PENSACOLA, Fla. (Dec. 21, 2018) – Santa arrived by fire truck to make a special appearance during a school-wide Christmas party at C.A. Weis Elementary School, A Community Partnership School in Pensacola on Thursday. The party was hosted by Baptist Health Care (BHC) team members and volunteers. 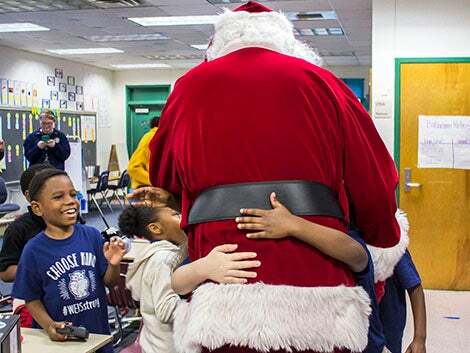 They donated gifts and goodies to bring holiday cheer to nearly 550 students. Pensacola Fire Dept. provided Santa’s unique transportation. BHC has hosted the Christmas party for more than 16 years. Team members say this partnership event is the highlight of their year. Funds for the party are provided through the Helping Hands team member giving program of the Baptist Health Care Foundation. The Helping Hands program is funded by generous contributions from BHC team members. For more information about this press release or to schedule an interview, please contact Kathy Bowers at 850.791.5254 or BHCMediaRelations@bhcpns.org. Baptist Health Care is a community-owned, not-for-profit health care organization committed to improving the quality of life for people and communities in Northwest Florida and South Alabama. The organization is a proud member of the Mayo Clinic Care Network. A 2003 Malcolm Baldrige recipient, Baptist continuously strives to be a national leader in quality and service. Baptist Health Care includes three hospitals, four medical parks, Andrews Institute for Orthopaedic & Sports Medicine, Lakeview Center, Baptist Medical Group and Baptist Heart & Vascular Institute. With more than 6,500 employees and employed physicians, Baptist Health Care is the largest non-governmental employer in Northwest Florida. For more information, please visit www.eBaptistHealthCare.org.